The lagoons were formed in spoil tips at the former Grassmoor Colliery, which operated on the site from the 1840s until its closure in 1967. Because of deep water and contaminated sludge, this area is currently fenced off to prevent public access. When British Coal opened the Avenue Coking Works nearby, it used the lagoon area to treat waste liquid from the coking works. During this time, large amounts of coal tar sludge from the works settled in the lagoons. 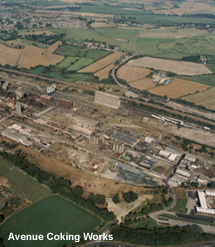 The works closed in 1993, and Derbyshire County Council took over the lagoons site later the same year.